When Polaris announced in early January that it was shutting down its Victory Motorcycles brand, the industry was aghast. Most people understood the closure — Victory hadn’t been the success story Polaris would’ve liked it to be. As the company said in the announcement, “Victory has struggled to establish the market share needed to succeed and be profitable. The competitive pressures of a challenging motorcycle market have increased the headwinds for the brand.” But there was still disappointment, as no one wants to see any brand in our already small industry falter. However, the closure of Victory means more investment and focus in Polaris’ more successful V-twin motorcycle venture, Indian. Since Polaris acquired the brand in April 2011 and released its first all-new models in August 2013, Indian has been a highlight for the company. The year 2016 was another year of growth for Indian, Steve Menneto, president of Motorcycles for Polaris, reported. In the 2016 fourth quarter, ending Dec. 31, Indian retail sales were up about 20 percent over Q4 2015. And the worldwide dealer count grew to about 400 by the end of the year. “If you think about it, we’ve only been in the marketplace for 3-1/2 years with our new products, and in 3-1/2 years we started at zero and having that many dealers, having officially we’re up to 10 models with the Roadmaster Classic, so 3-1/2 years of continual growth and growth in dealerships and models. It’s just kind of that start, so a good start, but as the old saying goes, ‘You haven’t seen anything yet.’ We’ve got a lot in front of us, a lot of big plans and opportunities in front of us to continue to grow the brand and the overall business,” Menneto told Powersports Business. 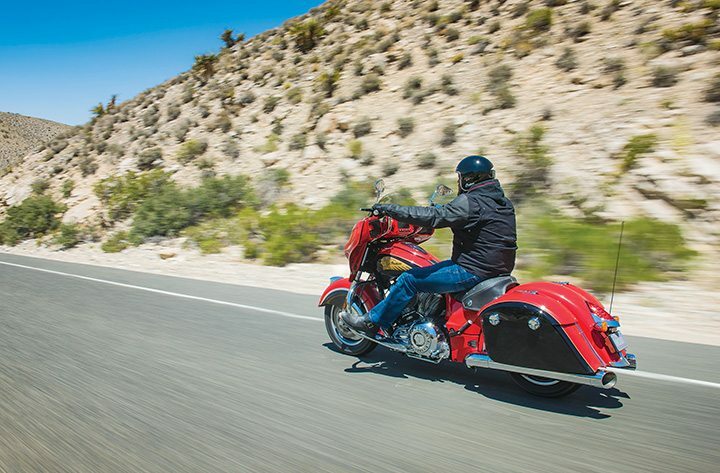 The Indian Chieftain with Ride Command has been a hot seller for Indian Motorcycle. The fourth quarter was the 16th consecutive quarter for market share and overall volume growth for Indian. Driving consumers to the brand, Menneto said, has been the historic brand, the value proposition and high quality of the products, the grassroots marketing efforts that put Indian staff face-to-face with Indian riders and prospects, and the passion of Indian dealers worldwide. “That’s what we’re striving for: to make great product, to continue to grow our brand and to continue to connect with our current owners and prospects in a grassroots, one-to-one level. I think that’s what’s making Indian an attractive brand to purchase,” he said. Though Polaris struggled with its Victory brand, which it launched from the ground up for the 1999 model year, Menneto says the lessons learned with that brand have led to a more successful Indian and Slingshot. Of course, he and others at Polaris have received a slew of negative comments from loyal Victory customers and dealers, who were disappointed in the decision, but it made the most sense business-wise, Menneto pointed out. The Victory closure could open space for competitors to take share from Polaris, however, the goal is to strengthen the Indian brand in Victory’s absence. “Our competitive friends will poke at it and say, ‘Well they’re not going to stay in Indian.’ Well, that’s ludicrous. That’s what they’re hoping from a competitive nature, hoping for that, but that’s not going to happen. … We’re going to be highly more competitive, and they’re hoping for us not to be there, but they’re going to have to reckon with us,” Menneto said. Indian has grown its cruiser market share with the popularity of its Scout models. The Victory closure opens more opportunities for Indian, as the brand can broaden its reach without having to worry about overlapping with its sister brand. “You’re going to see different designs, performance bikes, being in segments that we’ve never been in before, different powertrains, so the excitement around what the future holds for Indian and Slingshot in terms of an additional and more focused investment in two brands that are profitable, it’s going to be really exciting for our customers, our dealers and for Polaris, so that’s the upside of it,” he added. Plans are to unveil those new models in the next two to five years. Of course Victory was also using electric technology acquired from Brammo in January 2015 in the Victory Empulse, and Polaris will continue exploring electric. “The electric technology is an interesting one at Polaris. They’re going to think electric as a technology and a capability. And Polaris is bigger than just being a motorcycle division, so we actually moved our electric technology and capability into what we call central engineering, or into our technology group, so we’re trying to grow that across all of our businesses,” Menneto reported. New innovations in Polaris’ electric vehicles will likely be seen on the market in the next 4-10 years, he said, while an electric Indian won’t be released for at least five years. “In motorcycle, for Indian specifically, we will have an electric bike. It will not be just taking the current Victory Empulse and just branding it an Indian. We’ll be working on new bikes, but that’s in our out-years. That’s kind of years five and out,” Menneto explained. Though Indian clearly has a number of plans for the future, the brand’s staff is also excited about the season raring up now. The Scout has been moving well, and Indian is growing share in that segment. The Chieftain with Ride Command has also been well received, since it was announced in July. “The Ride Command technology on our bikes, our Roadmasters and Chieftains that have that, they’re growing even faster that when we didn’t have [Ride Command], so that’s very cool. We haven’t had a full year of that yet, so we look at ’17 as our mid-size business is going to go well,” Menneto said. At Daytona Bike Week in early March, Indian unveiled its latest limited edition Jack Daniel’s Indian Chieftain, following a successful rollout of limited edition Jack Daniel’s Springfield and Vintage models last year. And more unveils are planned for the coming months and into the summer. “Between some of the introduction stuff that we did last year, heading into a full year of retail with Ride Command and then some of the new stuff coming out and our mid-size stuff, we’re pretty bullish and excited about 2017,” Menneto said. Indian also plans to grow its dealer network in 2017, with the ultimate goal of reaching 300-350 dealers in North America and 200-250 outside of North America. As Connecticut's first and only dealership under Polaris, Brookfield Indian Motorcycle is proud to carry the Indian and Victory brands. The latter bikes are phenomenal, their owners are quite passionate, but the stark reality is that we sell 15 IMs for every VM. 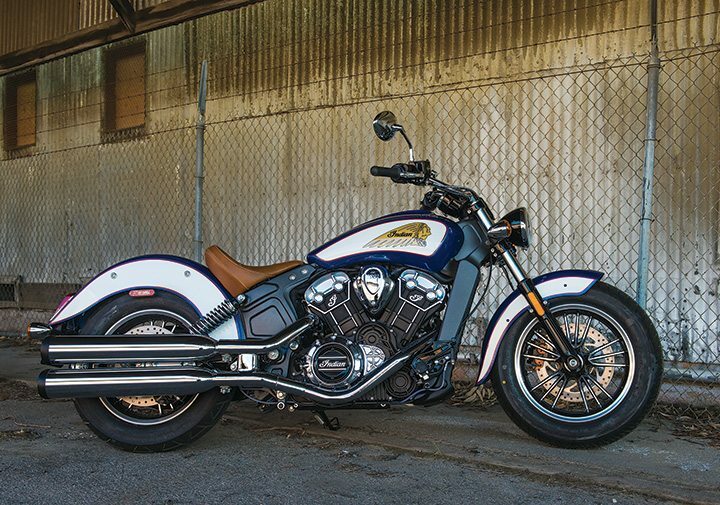 We will miss the VMs, but are quite excited about the future of Indian Motorcycle. These bikes are world class, bullet proof, precise, powerful and works of art. We are confident that new models will also hit the high water mark. Greed is what killed Victory. Greed led Polaris to set up a 2nd motorcycle channel for Indian. What they should have done is take the top 35-50% of the Victory dealer network and allowed them top buy Indians as an expansion of their MC line. When Victory sales collapsed (every MC dealer knew it would) shrink that side of product line. Place a small Victory logo on some of the new Indian models and everybody would be happy and even more Indians would have been sold at this date. The Scout appears to be carrying the Indian line currently. It's a great looking bike and rides extremely well. However, as a member of two Indian forums, the Scout has and still is suffering from quality and reliability issues. More than half of Scout owners who responded to a forum poll, had "starter" issues with their Scout, which appears to be more of an issue in colder climates. One member quoted that it's hard to believe that a company that makes snowmobiles can't fix a starter issue. Several Scout owners have been stranded and/or unable to use their bikes, and worrying if your bike is going to start doesn't and won't do well for future sales. I would hate to see Indian go down again, but they must resolve their current quality issues on their existing models before they expand their line. Also, a couple of members who had to sell their Scouts after about a year of ownership advised that they were lucky to get half of what they paid new. I know you take a hit on a new bike, but resale should be on par with Harley if Indian hopes to be a long term success. Good luck to the Tribe!